Boychik Lit: E-Book Blowout Madness One Week Only! E-Book Blowout Madness One Week Only! 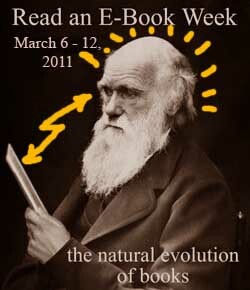 Do you think Darwin was more of a Kindle or an iPad kinda guy? It's that time again - basketball playoffs, baseball spring training, LA book fair anticipation, and best of all, the greatest annual electronic clearance sale while digital supplies last - Read an E-Book Week on Smashwords.com. This streaming, screaming extravaganza runs one week only - from March 6 to 12 (or until the last electron is out the door! ).